When the weather is crispy and cold, snow is on the ground, and fireplaces are working overtime there’s nothing like a toasty porter to warm you up. But, what does one do when one is tired of winter weather and longs for a touch of the tropics? 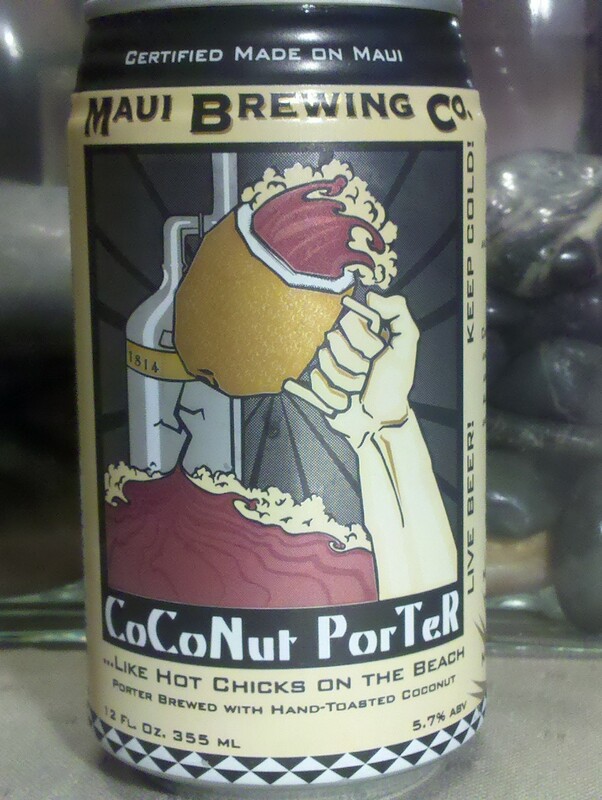 Well, you grab Maui Brewing Company’s CoCoNut Porter! Maui Brewing Company brought this unusual porter to the 2010 Portland Brewer’s Festival. The line for that particular beer was the longest one at the festival and unfortunately by the time I made it to the front of the line, it was tapped out. Bummer. But, since the Brewer’s Fest I’ve spotted the CoCoNut Porter in our local grocery store. Not in bottles, but in cans! Maui Brewing Companies philosophy on the use of cans vs bottles is the same philosophy that has been creeping slowly into the microbrew community. Cans are non-breakable, easier to chill, lighter to carry, and best of all, the are 100% recyclable! I was a bit apprehensive to try this beer, simply because the thought of coconut in a porter sounds kind of sickening sweet and just, well, odd. Well, I’m here to say I’m very pleasantly surprised. With a dark color and light coconut aroma, two of the senses are pleased immediately. The first drink is a malty-sweet (but not too sweet) surprise. Maui Brewing really brings a great tropical feel to this lovely porter by using six varieties of malted barley, Cascade and CTZ hops, and hand-toasted coconut. The result is a smooth porter with hints of chocolate, coffee and, of course, coconut. I was hooked after the first sip. Usually I suggest porters during the fall and winter. But, this porter is great any time of the year. At 5.7% ABV it’s not too high in alcohol, but because of the rich taste I would suggest this porter as a sipping beer. So, if you’re tired of having a white Christmas, try a CoCoNut Porter for a little tropical vacation. holy cow that sounds good!!! I’ve never seen that before. on a mission now!!! Oh I will find it!…It will be mine!! Great stuff, so many beers at Maui’s brew house in Kahana. You can find this beer in Bellevue at Whole Foods and at Top Foods. Thanks Gary! I’ll keep my eyes peeled! Oh wow, this sounds so delicious! I am going to have to try one asap! Love coconut! You make it sound like a slice of heaven. So, if Whole Foods up there has it, is it safe to assume mine will too? Dawn, thanks for the message. I think you may be able to find it in one of the more eclectic beverage stores like bevmo. Hope you enjoy it!